Have a pleasure in planning happy wedding With us! Download this app and start your stress free wedding plans! Try out different bridal hairstyle before your wedding! Browse our wedding blogs and forums, to get answers to your wedding related questions. Wedding blogs of iWedPlanner will give you some awesome wedding ideas. Plan your wedding budget using our free wedding budget planner calculator tool in iWedPlanner wedding website. Let's plan a wedding using this budget calculator tool for stress free. Use our free wedding checklist to make a note on your wedding tasks and day by day activities. It will help you to make sure that certain things are getting done in a timely manner. Creating a wedding photo album is a time consuming task, but 20 years from now it will be one thing you will be proud of. Contact us, to create a well rounded wedding album. Discover the finest wedding photographers across USA who can capture your best moments on your big day. From top wedding designers to some of the famous bridal shop. You can find all about the wedding dresses and attire here at iwedplanner. Find all the details of the wedding vendors and Tuxedo rentals across USA using our wedding database. Search here for the tuxedo rental shops. A wedding Day look is incomplete without the Jewelry. Look for some of the top wedding Jewelry shops and designers in our list. Give your wedding reception a perfect touch by adding decoration and lightening. Look for the lighting and décor rentals at iwedplanner. Search for the affordable wedding transportation and limo service across the states of USA using iwedplanner’s wedding database. Look for the countries best wedding caterers and catering services in iwedplanner who can prepare some of the delightful dishes. Search for the professional and experienced wedding planners around USA. Know all their information at iwedplanner website. Search at iwedplanner to find the best shops who offer excellent offers on wine and beverages. Present your wedding couples with something useful and something to remember. Look at our database to find the major wedding gift shops. Hire the perfect wedding videographer using our website; who can capture your wedding moments and create an amazing video documentary on it. Wedding invitation sets the tone for you before the wedding. Browse through our vendors list to find affordable and unique invitation designs. Music is the major part in wedding reception. Look at the best wedding music bands across USA using iwedplanner. A wedding is incomplete without having a honeymoon. Look at iwedplanner to find some of the exotic places to have a most beautiful honeymoon. The center of attraction in every wedding is the cakes. Search for your best wedding cakes and desserts vendors at iwedplanner. Plan your wedding different for other traditional ways and make sure it is noticed. Look at iwedplanner to find the unique wedding services. Use iwedplanner database to find the local wedding dance instructor near your area and make your first dance memorable one to remember. Look for the wedding ceremony musicians who are experts in playing the latest and some western classic music at your wedding. Make your house as home with some home decors. Search here for the best flats and houses for your new life beginning. Want to make your wedding night to be entertaining then hire a wedding DJ who can really rock your wedding reception. Look for the best DJs at iwedplanner. Plan your wedding makes-ups few days before your wedding. Look for the experts who are specialized in wedding hair and bridal make-up. Search for some of the affordable Hotels in USA to accommodate your wedding guests. You can find the best hotels and lodges at iwedplanner. Hire your wedding party rentals and wedding photo booth equipments at affordable price using our iwedplanner website. Planning a wedding will never be easy, but the potential problem areas can be managed. 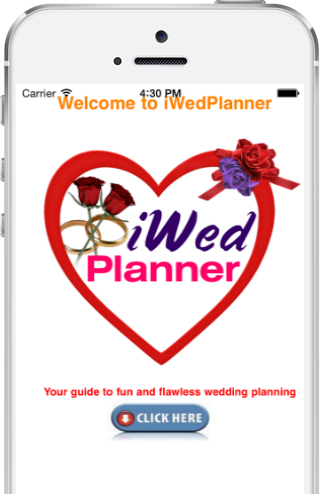 The iWedPlanner website for iPad, iPhone and android are designed to take you through every stage of the wedding planning process. Since you take your smartphone with you everywhere you will have all of your plans with you no matter where you go. Being able to add and subtract to your budget, to do lists, and RSVP list and moments notice makes planning your wedding simpler. You will not need a wedding planner to get great results. 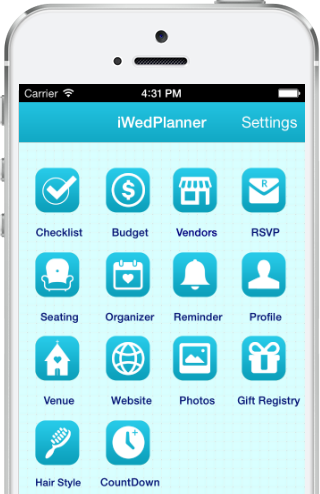 Use the wedding planner apps for your mobile devices to plan not only your wedding ceremony, but other important events and celebrations. The wedding app will help you to locate beautiful wedding rings , wedding dresses, wedding cakes, wedding flowers, wedding reception, wedding photographers You can also locate some of the world's top caterers and wedding cake bakers. The wedding planner app has such great features as a budget calculator and a feature that allows you to arrange seating for the wedding and the reception. Get valuable information from the wedding blogs and wedding forums.Keeping track of everything that you need to do as well as who's been invited, whose attending, who said guests and the like will require copious amounts of lists. The wedding planner mobile apps will free you from carrying around heavy day planners and notebooks because all your lists are included. 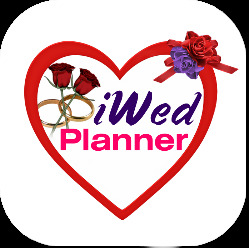 Using the iWedPlanner wedding planner mobile apps and wedding website will make planning the happiest moment of your life a lot less stressful. Organise your wedding plans using our wedding check list. Keep track of your wedding cost using our budget planner tool. Invite your wedding guest online using our RSVP tool ! Create your wedding guest seating arrangement using this feature. Keep note on your wedding plans using the wedding organiser tool. Set up your daily remainder of your wedding tasks and plans. Set up your wedding gift registries and add items in your lists. Have a freedom of creating your own wedding website here. Style our wedding day bridal hair using this feature. Save your best wedding moments and pictures here!. Its Fun! Count your months, days, minutes and seconds before your weddings. Get Your Wedding inspiration using this feature. The one thing that takes the stress out of wedding planning is being able to stay organized. With the iPad wedding planner app you can do just that it is the simplest way to make certain you never forget a detail. This app has been disastrous the way for the iPad large touch screen all design sign especially for the large screen on the iPad. All it takes is a few taps and you are on your way to planning the best wedding possible. 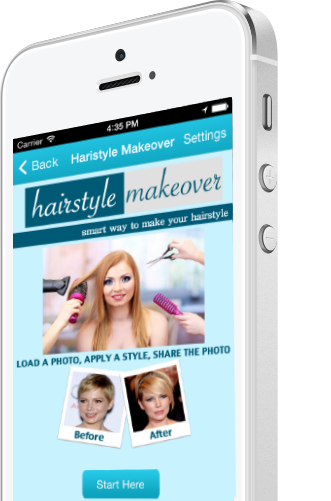 The app is very simple and easy to use and it is beautifully designed. Many people look at wedding planners as an expense they could do without. Most are unsure about what it is a wedding planner can do for them that they can’t do for themselves. There are actually a few options when it comes to hiring a wedding planner. You can let them help you plan the entire wedding or just hire one to coordinate the wedding day activities. Either way the bride will get a much needed break and help with making tough decisions. There is no longer any reason to have hard copies of wedding planning items like budgets, or to draw out rudimentary tables and chairs on a blank canvas. 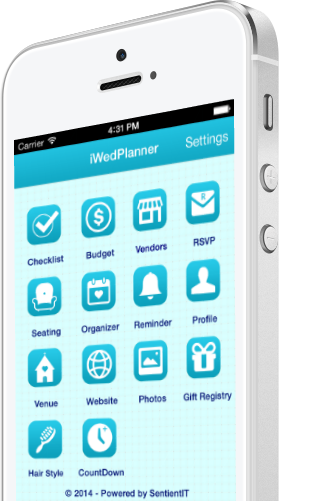 With the iPhone wedding app you can bring your wedding planning into the digital age. Thousands of couples have successfully planned their weddings and honeymoons using the iPhone wedding planner app. Many brides will already have some idea as to the flavor of the cake they want at their wedding reception but choosing the style and design can be a bit of a stressor. Use the free wedding planner apps for iPhone, iPad and Android to locate wedding cake vendors as well connect to the wedding website to view wedding cakes that others have used.